Is the Nikon mirrorless coming in September? 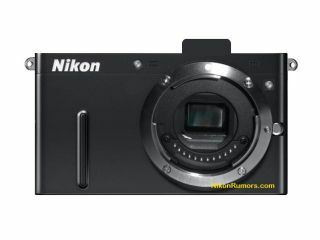 Is this the new mirrorless camera from Nikon? A Nikon event taking place in Vienna on 21 September is rumoured to be the date that the company will finally unveil its first mirrorless compact system camera, possibly even two. NikonRumors is reporting on a leaked press invite, in German, for an event called "Nikon in White" taking place in Vienna. The invitation also makes reference to the evening being "full of surprises". According to the site, there could even be two mirrorless models launched, with one smaller and with fewer functions. New lenses with power zoom switches, as we saw on the recent Lumix X range, are also expected to make their debut at the launch. NikonRumors suggests that there will be a super zoom and a pancake lens, along with two other lenses but no dedicated macro lens. It has previously been reported that the sensor on board Nikon's new camera would be smaller than micro four thirds to allow for ultra compactness. It's also likely that it would be compatible to F-mount lenses, giving existing Nikon photographers an incentive to buy one as a backup or travel camera. However, just last week, James Loader from Nikon UK claimed that Nikon did not need a mirrorless camera, as it is already offering products to meet every sector of the market. He also claimed that the current compact camera line-up would remain in place until at least Christmas or early next year. That said, the new mirrorless camera may be branded outside the Coolpix range. Other suspected specifications include a built-in high resolution electronic viewfinder, phase and contrast-detect AF, a pop-up flash and different colours. Stay tuned for more on any Nikon mirrorless updates as they happen.